Harold Mugford was born on 31 August 1894 in Bermondsey. He worked as a clerk by day and 18 December 1912 he enlisted in the Territorial Essex Yeomanry Regiment. At the outbreak of war he was mobilised and embarked fro France with the Regiment in November 1914. 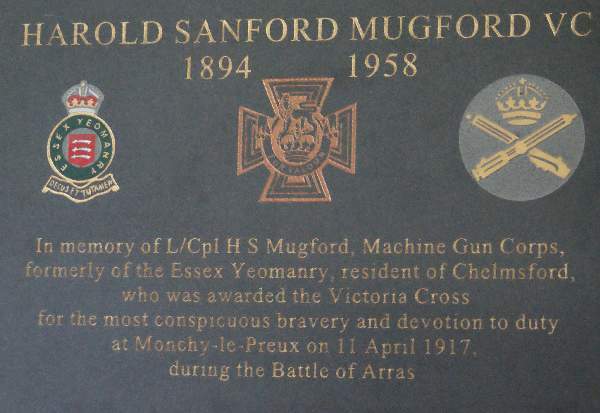 Mugford developed an aptitude with machine guns and in 1916 he transferred to the newly formed Machine Gun Corps, serving with 8th Squadron which was attached to the cavalry Brigade that Essex yeomanry were part of. On Easter Morning 1917 during the big Arras push he was involved in an action for which he was awarded the VC in the London Gazette 26 November 1917. On 11 April 1917 at Monchy le Preux, France, under intense fire, Lance Corporal Mugford, got his machine gun into a forward, very exposed position from which he dealt very effectively with the enemy. Almost immediately his no2 was killed and he was severely wounded. He was ordered to go to a new position and then to have his wounds dressed but this he refused to do, staying to inflict severe damage on the enemy with his gun. Soon afterwards a shell broke both his legs, but he still remained with his gun and when he was at last removed to the dressing station he was again wounded. After treatment involving the amputation of his legs and removal of shrapnel from several parts of his body he was invalided home where he spent two months at the Ampthill Road VAD Hospital in Bedford where he was a patient when the award was announced.. He was interviewed by the Bedfordshire Times saying " I am the lucky one out of many. I am sure that the others deserved just as much recognition, especially my no2, Corporal Jones, who was killed"
When asked about the day he replied " It came early in the morning. It was quite the most glorious sensation I have ever had, going over the top on a gee gee. We had an objective given us two miles away. We had to get there somehow and hold the place until the infantry could get up. They were shelling us like hell when I copped it"
In July 1918 he was presented with a cheque for £300 and a hand propelled wheel chair at East Ham Town Hall and he was formally presented with the VC at Buckingham Palace by the King. formally discharged from the army. He contained living in Chelmsford being President of Chelmsford Photographic Club and active in the affairs of the Cathedral, Chelmsford British Legion, Chelmsford Amateur Dramatics and more. His wife Amy became well know in Chelmsford for her work with the Women's Institute. .During the Second World War he was an active participant of many fund raising charities including the Chelmsford Flight of Fighters Fund.. Over the years he also gave many talks for charities and was always in demand. He died on 16 June 1958 after which his funeral was held in Chelmsford Cathedral with a plaque erected in his honour.